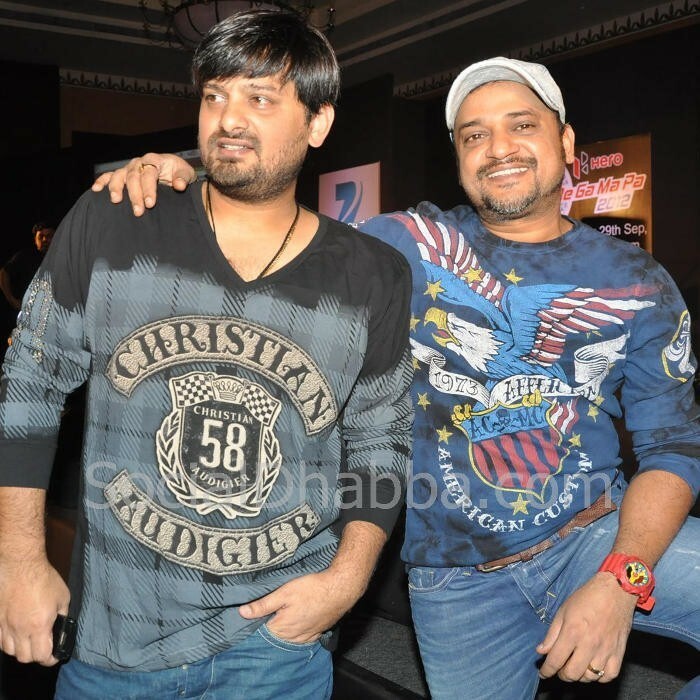 Sajid-Wajid is a Hindi music composer duo consisting of brothers Sajid Ali and Wajid Ali. Known for their work for Bollywood films, they have been honoured with the life membership of International Film And Television Research Centre of Asian Academy Of Film & Television. Sajid Ali and Wajid Ali were born into a musically rich family. Their father Ustad Sharafat Khan was a talented tabla player, while their grandfather Ustad Abdul Latif was honored by the Indian Government with Padma Shri, one of the highest civilian awards in India. Sajid-Wajid had learnt music from various music teachers including Ustad Allahrakha Khan and his brother Das Babu. Before turning into music direction, Sajid had tried his hand in import-export business, but he later was inspired by some of his friends to take music as career. Before working independently as music director duo, Sajid-Wajid also had worked with their father Ustad Sharafat Khan on an album, but this was never released. Sajid-Wajid first scored music for Sohail Khan's Pyar Kiya To Darna Kiya in 1998. In 1999, they scored music for Sonu Nigam's album Deewaana. The songs, Deewaana Tera, Ab Mujhe Raat Din and Iss Kadar Pyaar Hai went on to become hits. The same year, they worked as music directors for the film, Hello Brother and gave several hit numbers such as, "Hata Saawan Ki Ghata", "Chupke Se Koi Aayega" and "Hello Brother". In 2000, they scored the music for Baaghi. In later years, they composed music for several films such as, Kya Yehi Pyaar Hai (2002), Gunaah (2002),Chori Chori (2003 film) (2003), The Killer (2006), Shaadi Karke Phas Gaya Yaar (2006),Jaane Hoga Kya (2006)and Kal Kissne Dekha. The music duo have also composed music for several films starring Salman Khan, which include, Tumko Na Bhool Paayenge (2002), Tere Naam (2003), Garv (2004), Mujhse Shaadi Karogi (2004), Partner (2007), Hello (2008), God Tussi Great Ho (2008), Wanted (2009), Main Aur Mrs Khanna, (2009), Veer (2010), Dabangg (2010),No Problem (2010), and Ek Tha Tiger (2012; "Mashallah" only). They are currently composing music for Khan's next film, Jai Ho (2014). They are mentors on the Zee TV reality show Sa Re Ga Ma Pa Singing Superstar. Sajid-Wajid brothers are also brand ambassadors of Radio Noida 107.4F. Sajid-Wajid are currently mentoring the Zee TV musical reality show Sa Re Ga Ma Pa 2012. They have composed title track for television reality show Bigg Boss 4 & Bigg Boss 6. Received mixed opening and music was plus point for the movie. Sajid Wajid had scored music for some Non-Film Albums as Music Directors too. Sajid-Wajid had also given Background music to many films.